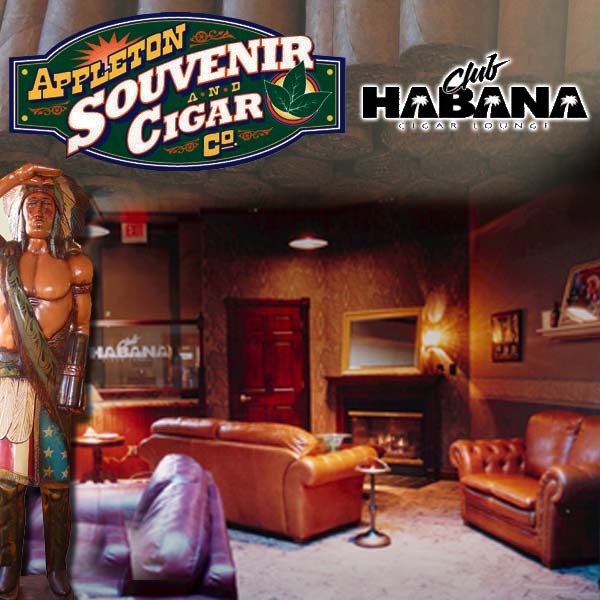 Appleton Souvenir and Cigar Co.
Born of a huge old storeroom within our 85 year old historic building, Club Habana was founded in October of 1998. It was envisioned as a private club with a turn of the century feel and ambiance. A place now open to the public where men & women of all walks could retire for an evening and enjoy a fine cigar, with an equally fine spirit. Habana Cigar Lounge has come to be known as a gathering place with a fraternal feel, free of smoking bans and cringing faces where the true smoker is the majority. Some of the Club Habana's amenities include a full cash bar with a large selection of single malt Scotches, Cognacs, Ports and Bourbons. You will enjoy high speed wireless internet access, a large screen TV with DVD & matched with a state-of-the-art digital surround sound system. Check out our comfortable atmosphere with leather seating, fireplace and a card or conversation table.